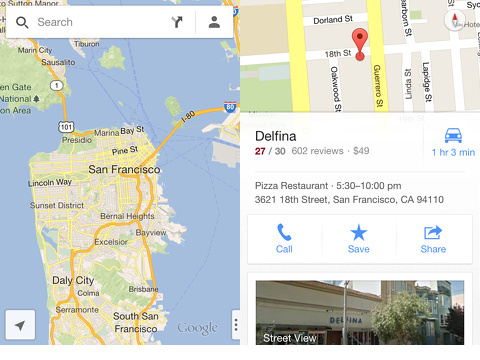 The much-anticipated Google Maps iPhone app is available for download. It is packed with enhanced tools, functions, and content that show remarkable potential. Unfortunately, the additional upgrades are not all effective or accurate. In fact, the Google Maps iPhone app couldn’t successfully navigate me to Starbucks. But, in an attempt to avoid the Apple iOS maps debacle, you have to acknowledge that the navigation features remain in beta mode with a tap on the screen. Google is simply not guaranteeing that you’ll make it to your destination. When you open the Google Maps iPhone app, you can establish some important preferences and syncs to maximize the functionality. First, you can select to participate in Google’s quest to improve its data by enabling anonymous location data to be provided and stored on your iPhone. In order to access your Google Maps information online and sync with your iPhone, you can select to authorize your Google+ profile. The authorization is quick, and your profile photo pops up. You enter your home and work addresses, as well as enable location services. The map view screen has sharp graphics and excellent navigation tools tucked away to provide a clear, uncluttered view. There is a search bar at the top of the screen with a route icon and a profile icon. In the bottom left hand corner is an arrow to move the screen back to your location instantly. A right hand sliding menu is available by touching the icon with three dots. You can check traffic, access public transit information, switch to satellite view, and open the Google Earth iPhone app. The ability to access traffic and public transit information quickly are excellent value-added features. The traffic patterns, however, are not at all explained. Suddenly, your roads may or may not have added colors. I assume this feature identifies areas with some sort of backup or flow issues, as the streets with the colors have those problems. A helpful pop-up to explain the colors would be helpful. When you enter items in the search bar and request directions, the additional bells and whistles are highlighted. I searched for Starbucks. When you enter a search, you can change between car, public transit, and walking with one touch. The map changed instantly into a shaded screen with red dots in the background. A white tab pops up at the bottom of the screen, and you pull a list of Starbucks up and over the screen. With a tap, I selected my Starbucks, and the screen changed to show my route. The white tab at the bottom of the screen can be dragged over the map with a vertical gesture. You can access information like reviews, street views, phone numbers, websites, interior virtual tours, and pricing. The most pertinent items remain at the top of this sliding snapshot of your destination like the chance to call and share details via text, email, and clipboard. You can also change your preferences for the mode of travel by pressing the transit icon. You are transported to another screen. For car travel, you can request to avoid highways and tolls. For public transit, you can select your preferred mode, as well as routes with fewer changes and less walking. You can also select to view transit options based on future departure and arrival times. For some customization options, you move to a different screen. For others, you may make a selection in a pop-up. These frequent transitions between screens and navigation tools can get a bit muddy. Some consistency in interface would elevate the tools and create a more cohesive experience. The step-by-step directions are presented with excellent, intuitive interface, as well as the caveat that they may be wrong. Your full route is shown on the screen, and a brief description of the time required, main thoroughfare, and preview option are available. The preview screens move you through the route with touches on a menu bar at the top of the screen. Each turn is outlined in a sensible manner. When you head out to your destination, the voice directions begin. The speed of the Google Maps iPhone app on satellite is shockingly quick. The directions were perfectly timed and concise on my route until they fell apart literally around the corner from Starbucks. Suddenly, the map and voice directions jumped a half mile away from my location. Starbucks was just a left turn away, and the Google Maps iPhone app told me to turn right. When I made the wrong turn, the map instantly switched to a location-based view and the Starbucks store information slid up on the screen just enough to call the store in one touch. When you travel by public transit, the tab at the bottom of the screen pulls up nicely-organized step-by-step public transit directions. The interface for presenting the directions for all of the modes of transit is fantastic, but you may just wind up one block in the wrong direction. Do the added features and acknowledgement of less-than accurate directions make it a better choice than its competitors? Surprisingly, the answer is yes. The Google Maps iPhone app is forward-leaning in its content, organization, and gesture controls. With finesse and tweaking, the wonky aspects of this new way to look at maps could quickly become beautiful and efficient. Unfortunately, all of Google’s cars, satellites, and cameras have just not documented every detail of every existing road. 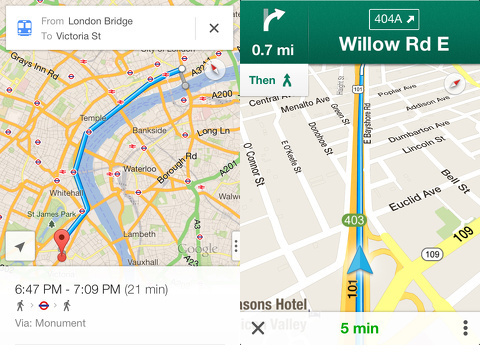 Until then, the Google Maps iPhone app will remain less than perfect. AppSafari review of Google Maps was written by Jenni Ward on December 13th, 2012 and categorized under App Store, Free, GPS, Maps, Travel, Utilities. Page viewed 5775 times, 2 so far today. Need help on using these apps? Please read the Help Page. When new apps get deployed, they will usually almost always have bugs in them or not have all of the latest features that are needed in order to achieve maximum productivity. But even with the setbacks of the new Google Maps for the iOS it will still prove to be more effective in navigation means than other apps on the market.